Our training process is very extensive for many reasons. It is our priority to deliver a flawless product and quality service. 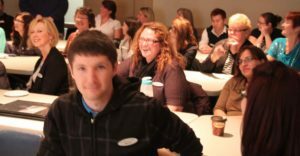 Having our employees fully trained in the Canadian Income Tax Act as well as our procedures not only helps us achieve our goal but it also empowers each of our team members. The knowledge they obtain instills confidence and pride in everything they do. We spend more months of the year training than we do preparing taxes. From June through August, we develop and prepare the courses for the upcoming tax season; each year the material must change to reflect the new legislation and tax-rates. Our various courses provide 13 – 14 weeks of learning and run from September to December. 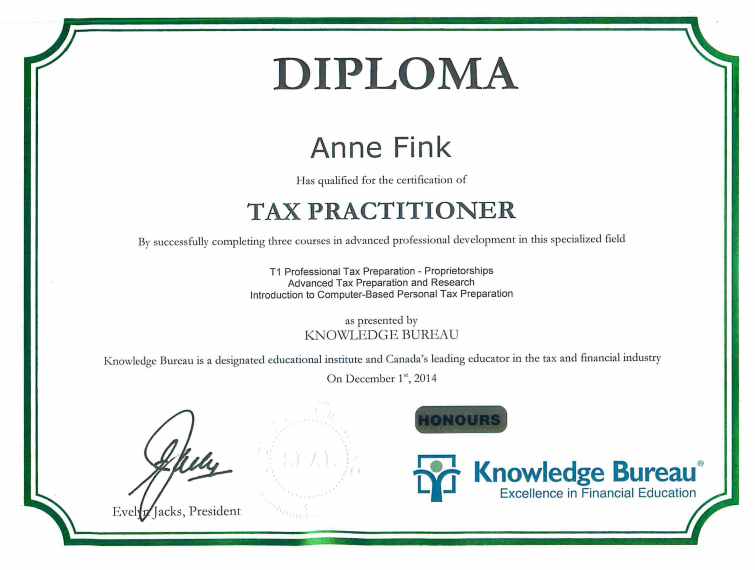 The courses are in-depth training in the Canadian Tax Act and all government compliance. We facilitate a number of tax courses for our team of year-round and seasonal employees and offer various levels of training using a variety of platforms. Each year we develop income tax courses to reflect the types of scenarios and issues that are experienced by our clients. Our courses are tailored for the interest and needs of our staff. Throughout the course, our staff meet on a weekly basis in a classroom setting to take an in-depth look at the Canadian Income Tax Act. After each session case studies and in-depth questions are assigned for staff to work on independently to test their knowledge. In addition to the 3 hour in-class session, it is expected that each staff will spend 10-15 hours each week on self-study and research. For our most seasoned tax preparers, we offer specialized courses in business, partnerships, international tax, final and trust returns. These courses are taken individually on a self-study basis utilizing one of the advanced courses through the Knowledge Bureau. Most of the time the employees taking these courses get together for study groups, where they exchange ideas and viewpoints. 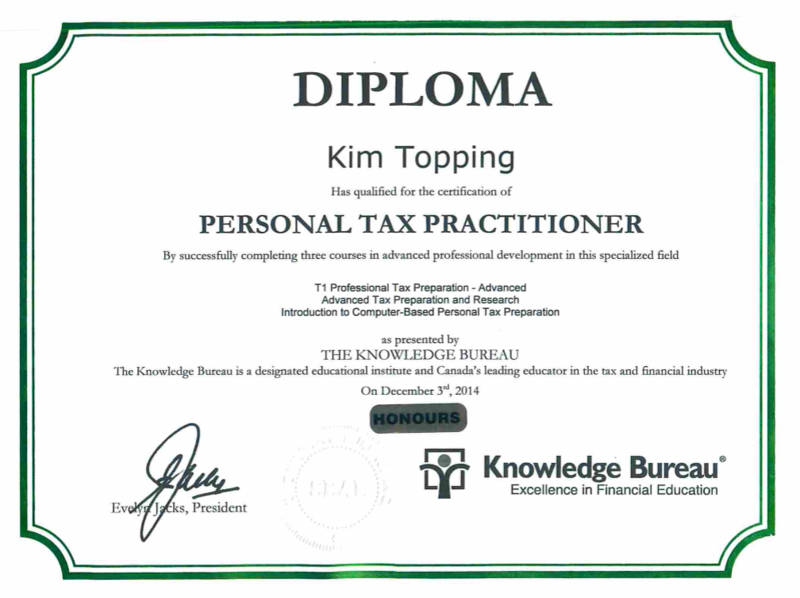 A number of our employees have been able to earn diplomas in Tax Preparation as well as Tax Financial Planning. During the month of January we run classes 3-5 days a week for our new and returning co-op students joining us as well as any new hires for the season. This training reviews the tax course we just concluded and new tax laws. Then, they receive extensive training in our practices and procedures in a classroom environment. On the floor training begins the last week of January until mid-February where they are shadowed by a year-round employee throughout all of this training. Our co-op students’ work terms generally lasts 14 – 16 weeks. A minimum of 6 of those weeks are spent in training to prepare them for the incredibly busy office we have for 8-10 weeks. We also conduct extensive training pertaining to each position and their duties. During the evenings in January when the office is not yet open past 6 pm, all of our seasonal employees partake in refresher and update training. Regardless of how many years the employee has been with us, they must complete all of the training sessions. This training focuses on all of CRA compliance regulations and our company policies. We govern very strict privacy policies and computer usage policies in order to protect our clients’ information. It is paramount to us as a company that every client deals with a well-trained employee. We ensure that each of our staff has the opportunity to have hands-on experience without the client present, allowing them to take their time and ask questions. Our training program utilizes a variety of methods to provide our staff with as much experience as possible. Our training encompasses so much more than just taxes, though. During the off-season, we partake, as a group, in various leadership training. Our staff are always taking advantage of every opportunity for learning, growth and bringing those skills back to offer our clients an even better customer experience. In 2009 Crystal, along with 5 of the core team embarked on a 7-day leadership cruise through the Caribbean. While fun in the sun was definitely had on this cruise, each day, workshops were held as a team to help each other grow and learn new tactics and skills for dealing with any situation that may arise. A large part of our camaraderie and team spirit is ignited by the recognition and reward programs we have in place. Each staff member is given a lanyard that displays service pins and tags they have earned. Through tax season we conduct an employee of the week program where a different theme of recognition is posted and their peers and supervisors nominate them. Each week a winner is picked and they earn a recognition pin as well as tickets for prize draws we have at the end of the season. We also award and recognize suggestions of innovative ways of streamlining our process and for any outstanding service or achievements. At the end of Tax Season all staff including management vote on two categories: Rookie of the Year and MVP. The winners of these categories receive recognition at the Tax Bash as well as trophies engraved and personalized by Crystal. The spirit of these awards become a focus during tax season and team members will campaign for one another; it brings out the best in everyone on the team. Each tax season is started with our annual kick off meeting. This meeting is held off-site and is a meet-and-greet type of meeting. We each get up and introduce ourselves, talk about our role within the company, share about our personal history and how we came to be part of the C & V Income Tax Services family. It is a personal evening that allows us to get to know each other on a different level and reconnect with those valued work-family members who we may not have seen for a couple of months. 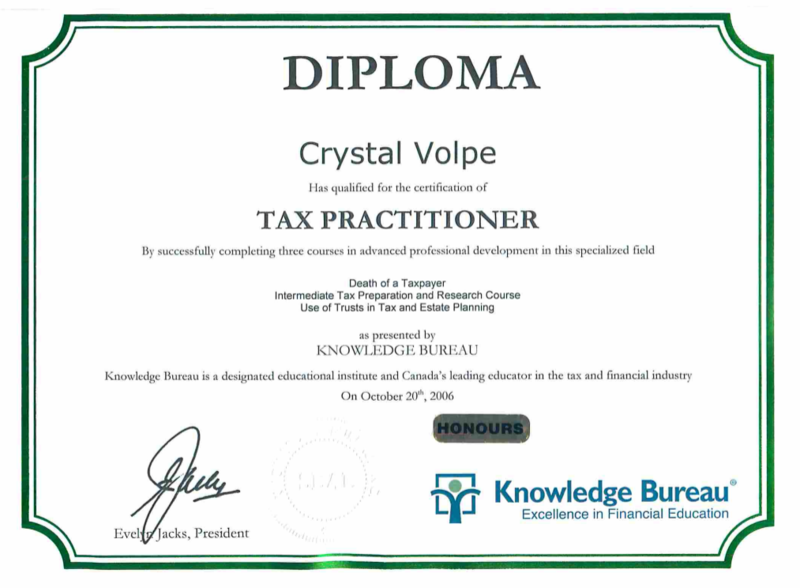 We celebrate various achievements since last tax season (marriages, births, promotions, etc) and recognize all the graduates and honour roll students from our courses. With the size of our office and the number of staff, this is the first of only two times where our entire team can be together in the same room at the same time. The first Saturday after tax filing deadline is always our annual Tax Bash – our celebration of a job well done. It is an event that the entire staff looks forward to each year. We have had our Tax Bash in many forms, coupling it up with charity fundraisers and supporting our community. Once our group got so large in numbers we started to organize our own events. 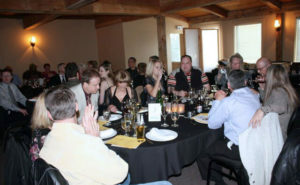 We include all the spouses of each of the staff and invite many of our vendors as well. 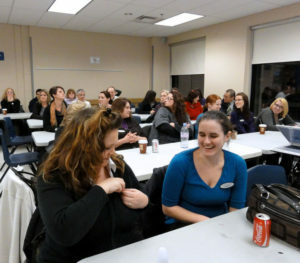 During the evening the staff and their guest can win tickets for draws and prizes. Staff members also earn tickets throughout tax season in recognition of their hard work, dedication, attitude and commitment. We invest over $4000 in various prizes and awards and almost everyone wins some sort of prize throughout the night. It is a grand time to celebrate and say goodbye to our seasonal family, which often results in a very emotional evening. It is a very memorable part of our tax season and always a way to finish off our season on the highest of notes!! Throughout the year the recognition does not end. At the end of our courses, all graduates are invited to a graduation dinner to celebrate their accomplishments with each honour student receiving recognition. Hard work, dedication and commitment are recognized in many ways at C & V Income Tax Services: Staff has been awarded tickets to events like the East Coast Lobster Fest and the RCMP Musical Ride (both held by the Bethany’s Hope Foundation, where C & V Income Tax Services was a Silver Sponsor).